Involving a designer in the creative process from the start of creating any beer is a good idea. With craft consumption enjoying double digit growth, breweries are so prevalent that 75 percent of drinking-age adults have a brewery within 10 miles of home. New beer styles are created every day adding to the myriad of year-round and seasonal flavor options. This boom makes the fight for shelf space fierce, and the fight for consumer attention, and selection, an all-out war. Gone are the days when the brewer’s nephew with an old version of Paintbrush can get away with putting the family dog on a label. Going with a design pro on branding and packaging is a smart move that could mean success short and long term for a brewery. 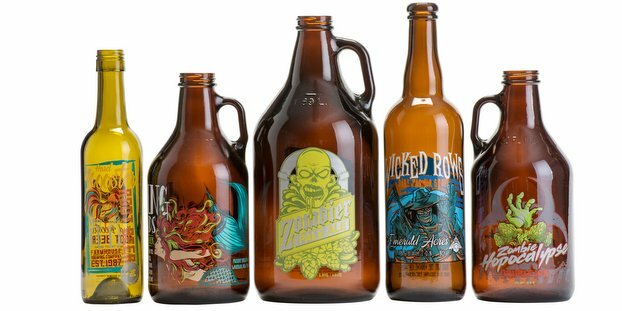 Graphic and package designers are essential to give brews a competitive edge among a multitude of local, regional and national craft brews vying for attention at retail that have grown from a few feet to multiple aisles. Brewers are depending heavily on packaging to make their brand statement. Visit your local bottle shop. Take a visual survey of beer brands likely to be on the shelves with the brand you are designing. Ask yourself “Does my beer stand out? Is it unique? Would I select it?” Ask a craft consumer in the target market to judge, as well. Who is most likely to drink the beer? Design packaging to appeal to their likes, dislikes and motivations. According to new data from the Brewer’s Association, 57 percent of millennials (21-29) are weekly craft beer drinkers — and take note, 25 percent of this group are women and 21 percent are Hispanic. Millennial males purchase a craft brand that they have never heard of or seen advertised 47 percent of the time and try 5.1 different brands per month, according to Nielsen Research. A caveat: beware of lumping all market decisions in the popular millennial bucket – 24 percent of Gen Xers are also weekly craft drinkers and could be your after-work party buyer. Involving your designer in the creative process from the start is a good idea, including selecting the name. There are thousands of IPAs, and it seems every wacky name for a hoppy beer has been used. The U.S. Patent & Trademark Office has reportedly received at least 25,000 active registration applications from the beer industry, so how do you make your’s stand out? Regardless of name, be descriptive of what style is in the bottle because confused hop heads will just snag the more forward choice. If the brewery is small and has yet to make a statement, or the brewery name is very unique, such as a specific location, consider using the style as the beer name and focus on the great brand graphic (hopefully the designer was a part of designing the brand and has a history and future path for development). This strategy builds the overall brand identity and leaves no opening for a lawsuit (just ask Lagunitas about Stone Brewing’s “Sosumi IPA”). We’re thirsty for a beer with a good story. Research by packaging company WestRock, shows that 64 percent of craft shoppers purchased something new after reading the label — after four and a half minutes (on average) reading beer labels. Give your market something unique to love about the brand. Authenticity, community and sustainability are key words to get you started. What’s the brand’s personality? You probably know which brand is “the beer of summer”, or the one that makes “off centered goodness for off centered people”. Developing the positioning statement is a good exercise in articulating why a beer is unique. Is yours local, low calorie, innovative, green, adventurous, brewed by minions? Once you figure it out, stick with it and shout it out loud. Some stylish designs from the MLB Creative team, working with French Town Brewing in the Virgin Islands. Retailers often display single bottles or cans, so your labels have to do a lot of heavy lifting. The choice of cans or bottles is often a result of capacity and budget, but currently, cans are trending, which is good news since it’s a much better canvas for 360-degree design. For bottles, the shape of the label, necker and cap – even inside the cap, as Magic Hat does — communicates your brand. Your label stock makes a statement, too. According to a Clemson University study, customers fixate on glossy film labels, and clear film labels keep shoppers interested the longest. If your beer is a premium brand with a premium price point, choose premium printing techniques: unique paper stock, metallic inks/foil, emboss or die-cuts; and of course, custom typography, photography or illustration will help achieve a top-shelf look. Even if yours is a limited operation brewery, you can make a statement with pressure sensitive labeling adhered to small batch blank bottles to give a big shelf presence. Make sure the easy stuff is covered on your packaging, including beer style (e.g. IPA), volume, etc.— which you can find online by market. Alcohol percentages are not required by all states, but it can be a selling point so go ahead and include it. Be sure to conform to industry standards: for example, the alcohol volume needs to be expressed within 0.1%. Make the most important text legible from a distance (think of it like a billboard). Graphics should be memorable (eg. Fat Tire and the classic bicycle), as well as distinct, easily recognizable, with unique, identifiable shapes (eg. Sierra Nevada). Choose colors that help your labels stand out (eg. Cigar City Brewing). Be prepared to go through many iterations — It’s important to launch your label right, and that may take trial and error to discover your true beer character. Devote some time to test marketing to see how your label holds up in the marketplace; ask current drinkers of the brand, but also test those unaware of the brand. According to WestRock packaging suppliers, 73 percent of craft consumers say they usually know what they’re looking for when they enter a store, and 95 percent of consumers search online before making a purchase. The “Rule of Thumb” is that it takes seven touches for someone to actually remember your brand, whether through a post, ad or on a label. So, start creating demand before a shopper sets foot in the beer aisle. The package is as important as what’s in it. First impressions count big. Grab a beer and browse beer label design blogs (like Oh, Beautiful Beer or The Dieline) with a goal of being the next brand featured. Cheers! Terri Brown is CEO of MLB Creative.